I don’t know about you, but I didn’t eat so healthy over the holidays. All of the amazing cookies, chocolates, casseroles, gravy, stuffing, cakes, and everything else you could possibly think of that’s NOT healthy for you…that’s what I ate. Oh wait, I believe there was a green veggie or two squeezed in there, although it was cooked in pretty much nothing but butter. Yikes! After going to bed with a bloated belly the other night, I swore to myself that I would only eat vegetables for the next few days, to bounce back from the sugar loading. Personally, I’m a fan of veggie burgers. 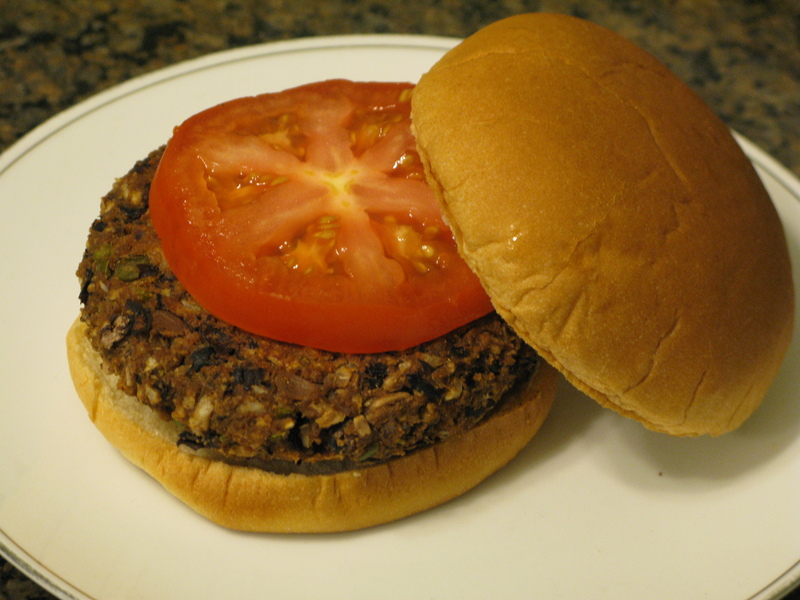 I started out with the frozen veggie burgers years ago…and although they weren’t bad, my family went to a restaurant that’s know for its delicious burgers. As I was looking through the menu, there it was…the veggie burger. Made from scratch. So, I decided to get it…and wolfed that bad boy down. It was awesome, so I decided to make one at home as well. When it comes to veggie burgers, what’s great to top it with? Veggies! That’s right! Adding sautéed onions and mushrooms to a burger only makes it better in my eyes, and this is a perfect example to add to its wonderfulness. If grilling, preheat an outdoor grill for high heat, and lightly oil a sheet of aluminum foil. If baking, preheat oven to 375 degrees F (190 degrees C), and lightly oil a baking sheet. In a medium bowl, mash black beans with a fork until thick and pasty. In a food processor, finely chop bell pepper, onion, and garlic. Then stir into mashed beans. In a small bowl, stir together egg, chili powder, cumin, and chili sauce. Stir the egg mixture into the mashed beans. Mix in bread crumbs until the mixture is sticky and holds together. Divide mixture into four patties. If grilling, place patties on foil, and grill about 8 minutes on each side. If baking, place patties on baking sheet, and bake about 10 minutes on each side. **These can be made ahead of time. Wrap individually or store in ziplock bags in refrigerator for up to 5 days, and in freezer for up to 3 months. To reheat, place in microwave for 45-60 seconds on each side.